Nyandungu bamboo greenhouse in Kigali. The Ministry of Environment, through Rwanda Water and Forestry Authority, has partnered China Bamboo Aid Project to import bamboos for use in industry packaging as well as production of hygiene paper products. The bamboo shoots, officials said, will also be considered for food. 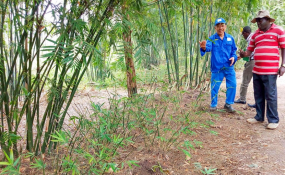 Augustin Mihigo, Bamboo Production and Non-Timber Forest Products Specialist at Rwanda Water and Forestry Authority, told The New Times that bamboo will also be planted along the river banks to conserve the environment. He said that new breeds to be planted include dentroclamus giganteus, dentroclamus barbaturus, dentroclamus strictus and dentroclamus latiflorus - alternatives to the yellow bamboo that government is phasing out. "We have now about five big bamboos species of which some are edible as vegetables (salad) when they are still young and can also be processed into other food products with some technology that's used in China. The others are for timber to produce tiles, packaging papers and hygiene papers," he said. He said that there are other species such as thyrsostachys siamensis and bambusa textilis which are small in size and are very good for furniture. "The species are being piloted on three hectares in Nyaruguru District," he said, adding that there is also a nursery on half a hectare for multiplication at National Tree Seed Centre in the Arboretum forest of Huye District. "The multiplication is underway while we also teach people on cooking methods. It is yet to reach mass consumption," he said. Nyandungu bamboo greenhouse in the City of Kigali is one of the nurseries with new species that have been introduced under the project. Another greenhouse for the bamboo species multiplication is being built in Rwamagana District while plans are underway to identify a new site for the construction of fifth green house in the City of Kigali. Each of the three greenhouses in Huye, Rulindo and Nyandungu (Kigali) has the capacity to produce up to 1, 500 seedlings in six months. Mihigo said that, in the 2019/2020 fiscal year, the bamboos will be planted on 300 hectares. Most of them will be new breeds. "We have secured the budget. One hectare requires Rwf2 million to be planted," he said. Rwanda, he said, has the potential to grow 30,000 hectares of bamboos. Shortage of land, however, is a major challenge. "We have not yet got enough bamboos for production of hygiene paper products and packaging materials despite having completed the feasibility study for the factory for which we are looking for an investor to partner with. We will start with a small model factory that can process bamboos from 500 hectares but we need at least 5,000 hectares to feed a big factory," he said. Jean Pierre Mugabo, the Head of Forestry Department, said National Tree Seed Centre is set for upgrade. "We are upgrading it in terms of quality, quantity of seeds, and expertise. We will also build another one in Rwamagana District to serve the eastern and northern parts of the country. We are working with Chinese experts to ensure that we multiply bamboos for edible and processed products," he said. Last year forests were planted on 4,800 hectares of which 2,700ha are in Eastern Province, which is prone to desertification.